Thank you for your interest in becoming a volunteer. 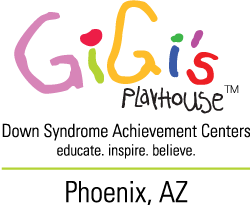 GiGi’s Playhouse believes in the power of volunteering to transform lives. We’re an organization that survives because of the amazing people who give their time and expertise! All of our volunteers are trained, coached, and utilized with the best interest of our participants at heart. Due to this focus, all volunteers of any age must first observe two programs prior to volunteering and will be continually assessed to provide opportunities for growth. Any volunteers under the age of 12 are required to volunteer with a parent or guardian who has also gone through a volunteer orientation. Volunteers age 13 and up must observe at least two programs and then volunteer alongside a volunteer coach. Volunteer coaches are seasoned volunteers who will assess if a new volunteer under the age of 18 should be volunteering alone or with a parent or guardian present. Volunteer coaches also decide which programs would be appropriate for volunteers of all ages. Note: all volunteers 18 years and older will be subject to a background search. Read our website so that you are familiar with our mission, vision, programs and events. Click on the “click here to volunteer” button below and tell us about yourself and your availability. We want to match you with the best volunteer opportunity possible and this information will help us do so! Visit the Calendar and attend an upcoming volunteer orientation. Meet with a member of our team! We will match you to a position based on YOU – and then we’ll get started so that you can help us make a difference! Programs: We have educational programs throughout the week and on the weekends at designated times (check the calendar). Volunteers are used to support the program host, interact with the kids and set up and take down materials used for the program. If you are a therapist or educator and are interested in starting or running a program, let us know! Literacy Tutors: Interested in helping a child learn to read? Then our literacy program is perfect for you! We have specific training for tutors, which include observation hours. Make a difference! Math Tutors: Interested in helping a child learn math skills? Then our Math Tutoring program is perfect for you! We have specific training for tutors, which include observation hours. Make a difference! Administrative/Facilities: Like to be on the computer or work on special projects? Stellar Microsoft® Excel skills? Super organized? We are always looking for administrative volunteers to help with thank you letters, program survey calls, creating books for our literacy program, database entry and more! Handy around the house? We could also use some help in the playhouse with simple things like changing light bulbs, putting together bookshelves, changing air filters, etc. Events: Each Playhouse has exciting events that are run by volunteers. Get involved with our annual Gala, plan and execute a holiday party for our participants, volunteer at our annual World Down Syndrome Day or plan your own fun event or fundraiser! Committee Members: Chair and committee member positions are open in marketing; social media/PR; programs; community partners and outreach; volunteer program; and fundraising. Feel free to contact us with questions at VolunteerPhoenix@gigisplayhouse.org or click on the button below to sign up!